Probably not if you’re sixtyish or less.I do though I have not thought about those wondrous two for years and years. The Palmer Method taught me how to handwrite the way I have all my life – cursive writing, it’s called. A blessing. And I loved spelling bees. I couldn’t even sing Happy Birthday but I was great at spelling. All this flashed back to me on Mother’s Day. We were all together at our festive dinner. Little Ruby had a cute card for her Memere, my daughter Monique. Memere is French for Grandma. Monique joyfully passed it around. It was my turn. Yes, very cute. Ruby had added a little note, very touching. First I noticed her signature. So distinctive! Then I read her a note. Her spelling was excellent, which was not a surprise. And I liked her message to her Grammy, so far as I could tell. I had to guess at it a bit. It was her writing. I frowned. Some of her words bumped into one another. She didn’t write the way her Grammy does. Or I do. What she had done was print all her letters and words. She thought a minute. “No,” drawing out the word very long. I could see she had no idea what the Palmer Method is. Chris and Kim, her dad and mom, were listening carefully. Well, I studied Palmer Method. And I’m sure her Memere did, too. That was all news to me. Ruby was listening also, of course. I looked at it. I frowned. She had printed it just like on her card to her Memere. I couldn’t make out any misspelled words. But again her letters were all printed. So not connected to one another. And she had labored in put all the words down. It had taken a lot longer than using cursive. And when she came to the word “write,” she had looked up and asked her Mom, “Is it right or write?’ Kim had said “‘write.” If that had happened to Ruby while on her iPad, it would have made the correction, I believe. 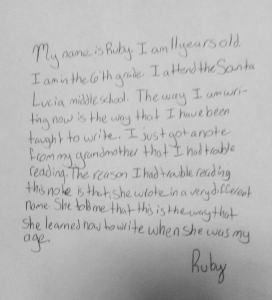 And if Ruby had taken part in a few spelling bees, I believe she’d know the difference between right and write. I took a photo of her work and here it is. Please look it over. See what I mean? Every letter stands alone. See how some words nearly touch? Her spelling is excellent. Isn’t her signature terrific?! Ruby is in the sixth grade now. A big year, I was told. Because in sixth every child gets an iPad. They do all their work on it in class and at home. They must bring it to school every day. All the lessons come to them on the iPad. There are no real textbooks. No need for paper and pencils and ballpoints. Monique and I have discussed this and she made a point. “Dad, Ruby does use a pad and pencil. I’ve seen her using them when she comes and visits.” That made me feel better. There is no blackboard. Instead, the teachers use a big computer screen that’s on the front wall. Can write some words or do a math problem on their iPad. What they do will show on the big screen. In one way, that’s fantastic. This is the Computer Age and this is the only age these kids know. The one they will live and work in. We old folks got into it late and the price we pay is clumsiness and exasperation. At the Worcester Telegram-Gazette where I worked, the paper scrapped all the typewriters and put in computers. We had to learn to use them and fast. I was hitting 40 and I remember how uptight I was. Some of my older colleagues were so shaken that they chose early retirement. Ruby and her schoolmates are at ease with it. Which is wonderful. Just about all of them have a cellphone. And they’re at ease with that too. They can send text and read text. No problem. No way can I argue with that. Ruby attends a public school in a nice small town. It’s not a big-bucks private school. And there she is with a free iPad. I marvel at that. But maybe that’s why the town’s education budget is so high. On the other hand maybe that expense is washed by the school not having to supply printed textbooks and writing supplies and so on. All while launching the kids in a most pleasant way into the marvels of computers. No way can I argue with that either.